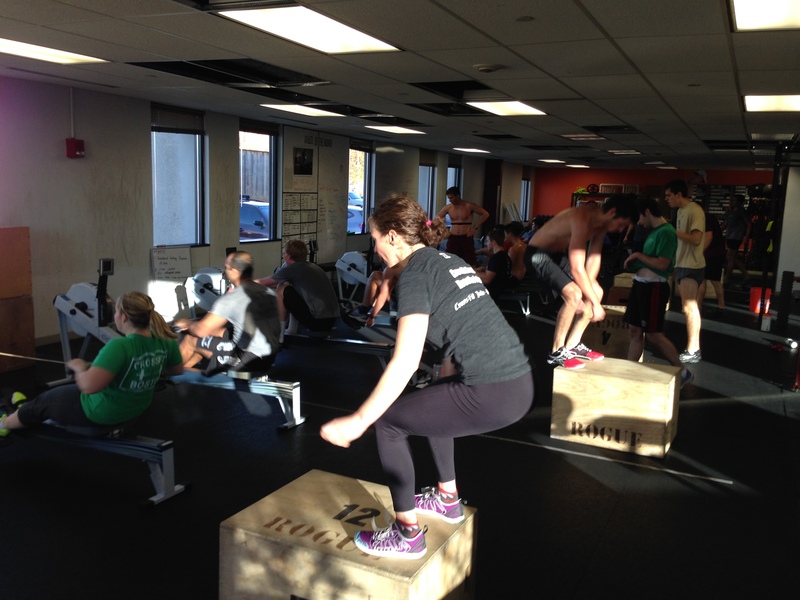 Rest Day 11/14/13: Got Skills? …Row and Get Some! 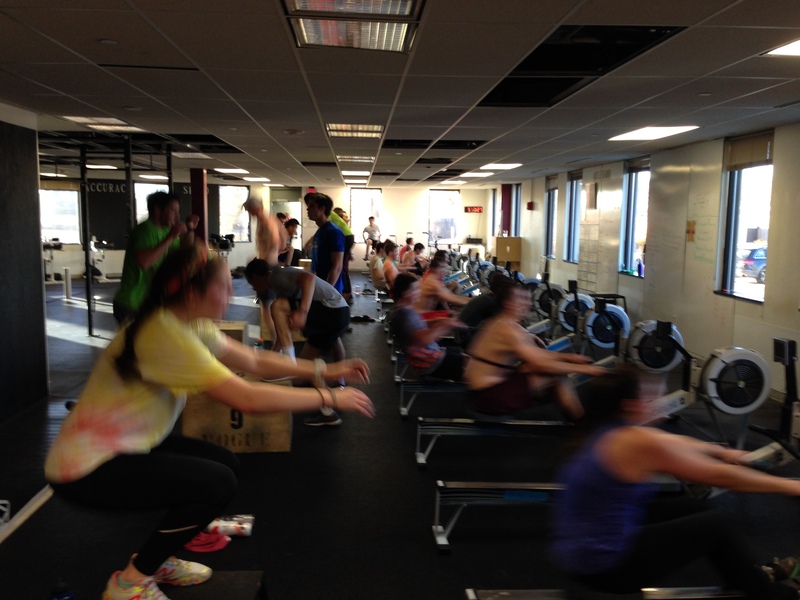 Jodie from the 7am class challenging the BC Men’s Crew Team! To master a skill is to know and have full control over every piece of a skill, both physically and mentally, when your fresh and your fatigued. Lately we’ve been pushing the intensity in the gym and many people have found themselves sore and out of it for a few days. One example would be Coach Tito and Carla of CrossFit Boston competing at the Southie Throwdown this past weekend. They literally were crushed from back to back competition days. What would you do on the Monday following a weekend like that? The days following a hard training day are perfect for mastering a new skill through active recovery. Rather than going back for a second or third hard training day and not performing at full intensity, commit to an active recovery day focused on mastery of the skills you’d like to develop. Carla did just that on Monday. Coxswains pushing hard right alongside their rowers! Rather than join in on the 7am class at CFB, Carla took 1 hour out of her day to actively recover, rather than sitting around and feeling sore. She set the erg for 2,000m of work and 10min of rest. She rowed an easy 2k and then spent 10 minutes working on her goats, handstand push ups, pull ups, and Toes to Bar. Three sets of this active recovery interval scheme gave her confidence with her skills and prepared her for a hard training day on Tuesday. This entry was posted in Motivation, Our Mission, Skill and tagged balance life, endurance sports, exercise, functional movements, new sport, rowing, sports, training by Renegade Rowing. Bookmark the permalink. Agree…I recover much better when I do a 10k or 45 minute low intensity row to get the blood flowing vs. just taking the day off. Often I find that these are very good technical rows that increase my confidence in my skills (hence they are better done on-water or on a dynamic erg). I think the reason is that with a tired body, I revert to muscle memory and don’t have the energy to waste in tensing up, trying to muscle it, etc. These recovery workouts are not necessarily slow pace, just very efficient. Agree on the recovery row – I often recover more quickly by doing a 45 min or 10K row to get the blood flowing vs. just taking a rest day. I also find that these are some of the best technical/skill rows, I guess because my body is tired and there’s no extra energy for tensing up and no temptation to muscle it. For this reason I also feel that they are best done on the water or on C2 sliders. They are not necessarily slow-paced rows, just very efficient and smooth. Love that thought ScullerX! Efficient and Smooth! So it really is a win-win, I think an active recovery day of rowing not only improves your rowing, but you can add in some skill work with your goats and improve those too, with the same mentality of finding smooth efficiency. Smooth is Fast! Thanks! Great stuff!